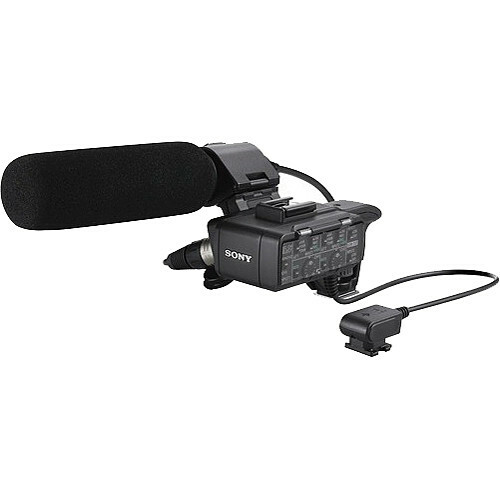 The Sony XLR-K1M Adapter and Microphone Kit features an ECM-XM1 shotgun microphone and an XLR-A1M adapter, allowing connection of your camera to professional-level microphones, mixing consoles and sound studios. The adapter features two XLR channels with separate controls, providing recording level adjustment, attenuation and wind noise reduction. Mic/Line input switching for each channel is also provided to simplify post-shooting editing. Two mic/line input channels help you capture detailed recording levels and control low frequency sound. The kit includes the ECM-XM1 shotgun microphone, but also enables users to utilize their favorite recording microphone. Sensitivity and directivity controls are also onboard. The XLR connectors lock tightly to the adaptor, securing the cable during video shoots. This is convenient when connected to a mixer or a soundboard. The audio level controls can be used in real time, offering detailed setting options. Box Dimensions (LxWxH) 9.9 x 8.2 x 3.9"
XLR-K1M Adapter and Microphone Kit is rated 3.9 out of 5 by 16. Rated 3 out of 5 by Mike from Works Great, but super cheap metal mount I use this XLR accesory mounted on my Sony NEX-VG 30. I use this when I'm on the road shooting run and gun segments with my food critic father. The unit itself works fine except the plastic cover over the gain dial broke the 3rd day as I accidently bumped the side (my fault no real gripe hear). Be weary though, as this product comes with a flimsy metal step/riser mount adapter that slides onto my NEX-VG cold shoe (connections are on Hot shoe for transmitted data, cold shoe mounts the unit). Disaste strikes. I was in the field and the entire metal riser part broke off! It is held together really ackwardly with tiny screws and tiny parts. Be aware, if this happens to you in the field you're pretty much out of luck! Make sure you carry tons of gaffers tape with you when you have this unit. Rated 4 out of 5 by Josh from Perfect for 1 man crew This is a great audio setup for the Sony A7s, especially if you're a 1 man crew. You will need a way to mount the mixing console on to your camera setup since it will require two hot-shoes, I recommend the Movcam cage for A7s for that. The shotgun mic that it comes with is decent, but I got this mostly for the 2 XLR inputs so I could run a boom mic into the camera and or a lav mic kit as well. It's great that you can control the audio levels with physical dials and not through the camera menu. Drains your camera batteries a little bit faster though. Rated 5 out of 5 by SonyLeicaDave from Colorless sound for Sony cameras I lash up this unit with my new Sony a7s, a Novoflex adaptor, and Leica M lenses. With that full-frame sensor the images are spectacular. And the audio, using this adaptor, matches it. Clear, clean, undistorted, uncolored, transparent...it is as good as any mic I'll ever use. Yes, it is pricey, but this is the best choice for my applications. Even the supplied shotgun mic is as good as a Sennheiser...I did a side-by-side shootout. (It might be nice if you could get the adaptor without the supplied mic.) There is a need for a camera mounting cage, and I have used a Fhugen I adapted to accommodate the hot shoe plug. Slick.I also an use this same adaptor on my new little Sony 4K Handycam. Works well in situations where a small video camera is a plus. Rated 5 out of 5 by Darryl S. from Adds pro inputs I bought this because it is the only way to get pro stero inputs (XLR) on the Sony AX100. The big suprise is that there is no way to mount it without another piece of gear. I found a great bracket at DM Accessories that screws in the tripod hole on the camera and then accepts the tripod plate. I haven't used it in all configurations but the audio is quiet and the mic is adequate. I will probably use my Senheiser or Rode for critical sound. I make natural history films and need sa detailed audio as I can get. Rated 3 out of 5 by TFHENRY from Brilliant idea, terrible execution. I really like the idea of this product and I think Sony hit the nail on the head with how to get XLR's onto a compact camera, however mounting options are a bit of a joke. The XLR-K1M and XLR-K2M should be the same product. Out of the box this adapter should mount to your cameras hot shoe (Sony MI - like the XLR-K2M), if you want to mount it on a rig, provide or purchase a separate interface / MI extender cable. Hot shoe to hot shoe to hot shoe... give me a break and put some 1/4-20's on this product. Rated 3 out of 5 by Daniel from Great sound, terrible build quality. Overall, this is a good product. The audio is fantastic and the supplied mic is very good. However, this is literally one of the cheapest feeling pieces of equipment I have ever purchased. It feels like one of those Chinese knockoffs, and definitely not professional. The screw to mount this onto your cold shoe looks and feels like something you would find at the dollar store. For $, I expected a MUCH more solid build.For now, this gets 3/5. The audio is 5/5, but the build is 1.5/5. I really feel like it will not hold up under constantly changing documentary circumstances, but I may be wrong. I am using this device with my Sony A7s mounted on to Movcam cage with a Sennheiser ew-112p G3 wireless lav, and will be taking it to Mexico and Guatemala to film a documentary next month, and depending on how it holds up I'll ad or drop another star. Rated 4 out of 5 by Alexander from XLR-K1M Microphone adaptor for Sony A7s This is an audio input interface that bypasses the built-in 1/8 stereo mini on the Sony A7 cameras. It works with the multi-purpose flash shoe on the top of the camera. The controls are similar to those found on the Sony video cameras (Line-Mic; Phantom power; Ch1/Ch2-Ch1/Ch1; and Attenuation). There is also an analog level control for each channel. With this adaptor, I am not planning to run a separate audio track for interviews, etc. Audio performance is acceptable, but I noticed a low-level hash which gets more noticeable on the high sensitivity setting. This is not noticeable when feeding a robust signal where the volume control on the XLR-K1M is at mid-way position or below. Biggest drawback is ergonomic: the connector occupies the flash shoe, so there is no place to attach the interface - you have to use some sort of bracket or rig, especially if you plan to mount a microphone or wireless receiver. Does this adapter work with Sony NEX-VG900 camcorder ? Many thanks in advance ! No. Although the NEX-VG900 has the Multi-Interface shoe and cold shoe to mount the adapter, there is not enough room on the handle to fit the adapter and the MI connector. Is there any way to purchase this without the microphone ? Sorry, the microphone comes with the XLR-K1M. Is this compatible with sony fdr ax100? How does this compare to the DR-701D or MixPre3 in terms of sound quality and noise floor? It is not possible to compare these devices because they each have a very different function and are intended for use in different applications. The XLR-K1M is an adapter and mic kit that allows you to connect two microphones to your camera, so your camera can record the audio. It does not have any type of recording capabilities built in. The DR-701D is a 6-track recorder intended specifically for DSLR video applications. The MixPre-3 is a recorder and mixer with a USB interface which can be used for a wide variety of audio applications, such as for musicians, videographers, podcasters, or field recording for news, etc. These devices are not interchangeable. Each serves a different purpose so you would select the appropriate tool for the job. Please feel free to contact us by phone at 800-606-6969, sales@bhphoto.com, or through live chat and we will assist you in finding the right equipment for your application. Does the K1 / 2 adaptor allow use for 4 audio channels on the FS 5? Is the smart shoe on the body of the unit or the one with the cable (or both)? I would like to mount this on a RX10MII to eliminate the cables of my current interface. Will this work with the A7III? Will this work on an FS7? Are the pin configurations the same? This design looks more flexible and better mounting options than the K2M version. These two audio devices are for Sony Alpha mirrorless cameras, not professional camcorders like the FS7 that already have XLR inputs. Here is an example of the correct microphone you will need: Sony ECM-VG1 Electret Condenser Shotgun Microphone B&amp;H # SOECMVG1. (Ignore the handle in the image; you will mount the mic directly into the mic holder on the FS7.) You then use the included cable to connect the mic to the camera. Easy peasy.